As I looked back on all of the recipes posted in 2011 I reflected on my personal favorites, and those that were your favorites. Often times they were one in the same. It has been such a fun year making all of these recipes and sharing them with you. I’ve already started on new recipes for 2012 and look forward to sharing them with you. So here are your Top 10 Favorites for 2011. 10. Pumpkin Pudding Puffs – These are made with frozen puff pastry shells. It’s like magic when they bake….they go from a small frozen disc to a beautiful light and flakey shell. All you add is the pudding and whip cream. 9. Kiwi Berry Smoothie – A great way to use berries and it’s healthy too. This recipe includes blueberries, strawberries, kiwi fruit, and flaxseed. It’s sooo good. 8. Goblin Tootsie Roll Cupcakes – These cupcakes are scary. But, I can overlook that because the goblins and trees with eyes are so cute. Oh, and they taste good too. 7. Bow Tie Pasta and Italian Turkey Sausage Skillet Meal – This is a super simple meal made in one skillet. The bow tie pasta makes it look so pretty and the ricotta and mozzarella cheese top it off perfectly. 6. Toffee Cupboard Cookies – These cookies have the best buttery toffee taste. The thinness of the cookie gives them the perfect light crunch. Ultra yum. 5. Cheesy Jalapeno and Bacon Skillet Potatoes – Fried potatoes with some flare….bacon, jalapenos, then topped with melted cheese. Great for breakfast with some eggs. 4. Baked Herb Parmesan Potato Slices – This was one of your (and mine) all time favorites. It’s really easy to make and a crowd pleaser every time. 3. Marshmallow Fun Pops – Here is another all time favorite. Although I didn’t think of it when I made these…they are great for DIY wedding favors. A number of wedding planning sites featured these cuties because they can be customized. They are a fun and easy favor for any type of party or event. 2. Candy Cookie Cones – Yet another all time favorite. These are unique and fun for kids (and adults) to decorate (and eat too). Ok…are you ready for the all time most favorite recipe of 2011…. 1. 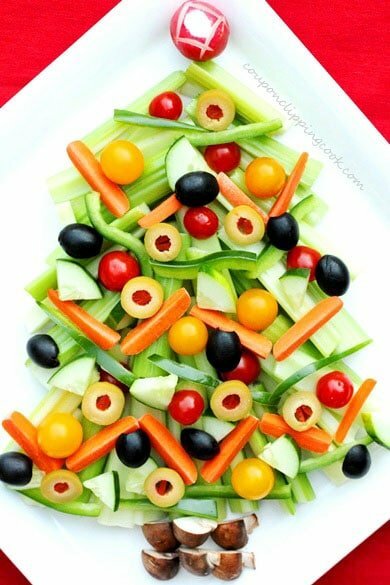 Christmas Tree Relish Tray – This is so fun to make. Kids will love to decorate and eat this tree! Thank you for visiting Coupon Clipping Cook and sharing all of the deliciousness in 2011. More to follow in 2012! I found you at Tasty Kitchen and think we have a lot in common cooking-wise! I’m your newest follower!! I’m excited to dig into your coupon and saving tips. Thank very much for the follow. I just went to you blog and love it. Your recipes look delicious and your pictures are beautiful. I’m your newest follower too! Thank you for your follow! Delicious line up, and I so have to make those potato slices 🙂 And of course I adored the relish tray…so cute! Loving this round up. That bow tie pasta looks killer!